Last year I bought two copies of 'Ole ole! 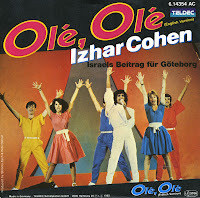 ', and I thought that would pretty much complete my collection of Izhar Cohen singles. But I was wrong. While this single features the English version of the track and this single features the original Hebrew version, I found another single that features a third version of the track. 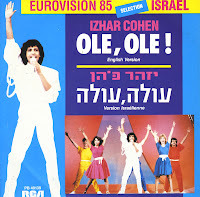 Izhar Cohen returned to the Eurovision Song Contest for Israel in 1985 after winning the 1978 edition with 'A-ba-ni-bi'. He performed the song 'Ole, ole!' together with four unnamed band mates. At the close of voting, the song finished 5th in a field of 19 competitors. I already have the English release of 'Olé olé' for a few months now, but it was a great relief to find this version, as it contains the original Hebrew version of the song as well. After buying six singles in the Soul & Dance department, I went a few numbers down the road and reached the 'Music & Video Exchange' on Notting Hill Gate. I went down to the basement, suspecting that if they were still selling cheap singles, they'd be there. And I was right: a whole alphabetized collection was waiting there for me. When I started browsing, this single was the first one (of the 37 I would eventually find here!) that I wanted to have. Quite a strange find. 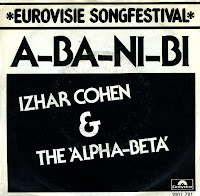 Izhar Cohen won the 1978 Eurovision Song Contest for Israel with 'A-ba-ni-bi'. Israel must have been looking for another victory when they sent him again in 1985. This time, he tried it with that famous Hebrew chant, 'Olé Olé'. The original version of the song (in Hebrew) is not included on this single, for it contains the English version only. I didn't even know the song had been released in the UK, but this is really an English pressing. The approximate translation of 'A-ba-ni-bi' is 'I love you'. So the title of this song is actually Hebrew, and not, as I always thought, one of those nonsensical titles which the Eurovision Song Contest became famous for. 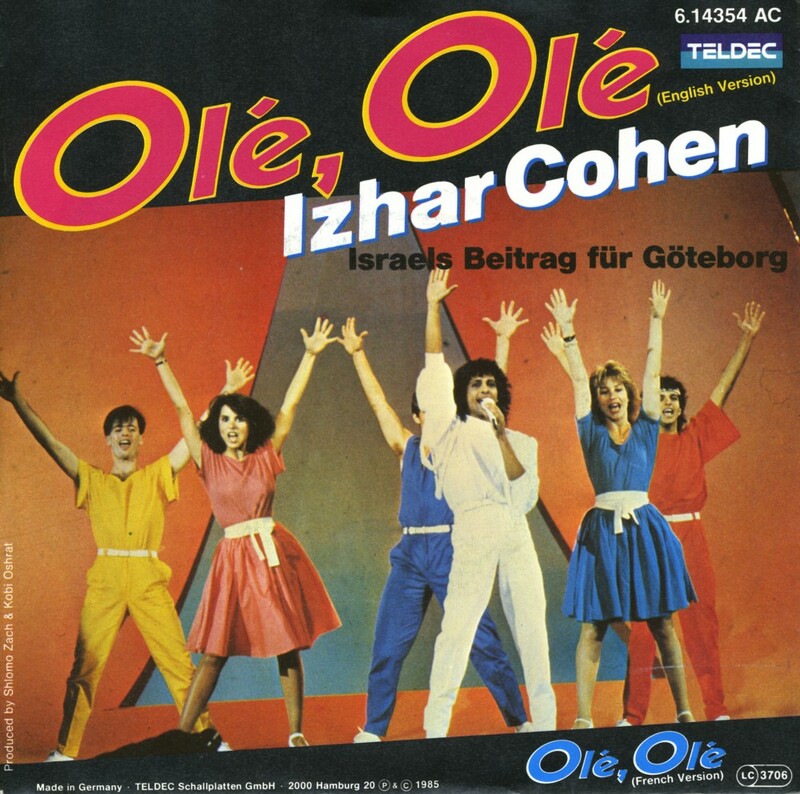 Izhar Cohen performed the song in 1978 and won the Contest, which meant that Israel won it for the very first time. Broadcasters in many of the non-participating Arab countries in North Africa and Asia who had been transmitting the contest, had to cut the broadcast when it was clear Israel was going to win. Jordanian TV famously ended the show with a still photo of a bunch of daffodils rather than acknowledge the Israeli entry. Several cover versions of this song exist, including an Icelandic one by Paul Oscar and a beautiful, almost transcendental version by K.O.B. While this song was performed in Hebrew on the Contest, this single features the English version only.